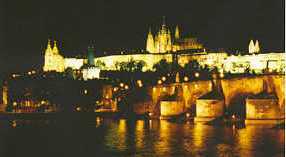 A photo of the St. Vitus Cathedral and Prague Castle taken from Charles Bridge. 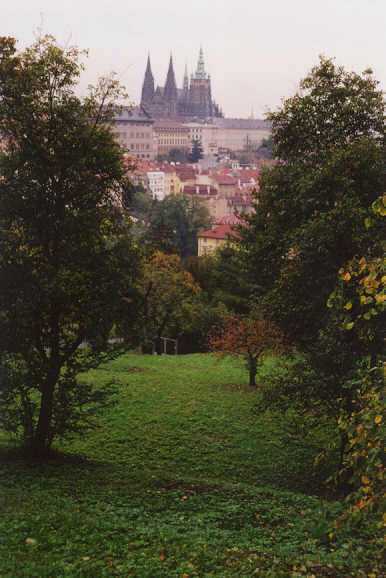 View of the Prague Castle & Mala Strana from Petrin Hill. 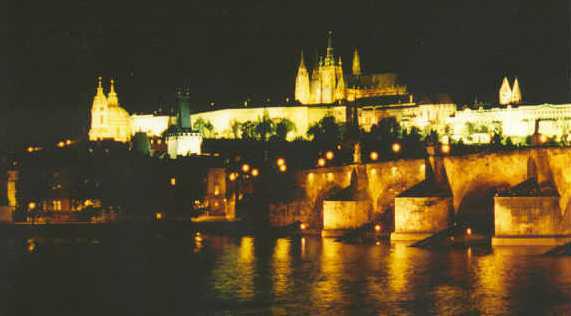 A photo of the St. Vitus Cathedral and Prague Castle by night. This photo was taken from Novotneho Lavka just by Club Lavka and the Smetana Museum.. 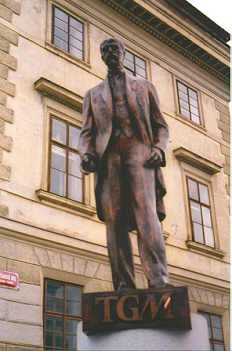 Statue of Tomas Garrigue Masaryk (TGM) who was the first democratically elected president of the newly formed Czechoslovak Republic (independant of Austria) in 1918. This statue is new and stands on Hradcanske Namesti (by the entrance to the Prague Castle). 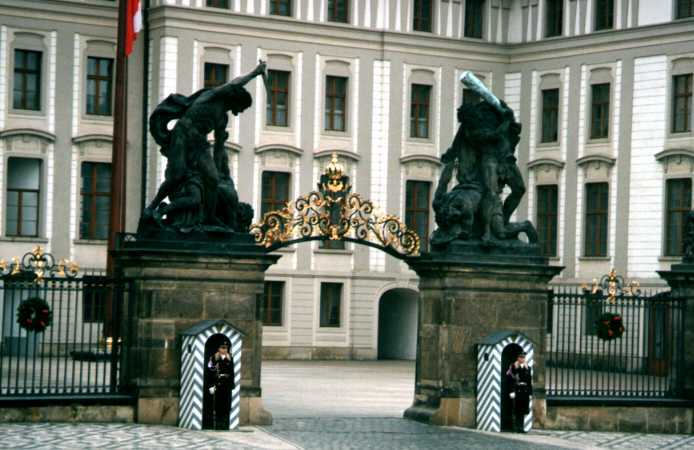 An interesting gate on Hradcanske Namesti. 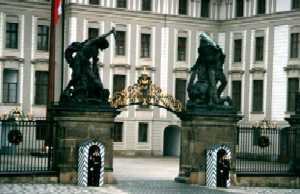 Left are the gates of the main entrance to Prague Castle, under guard. 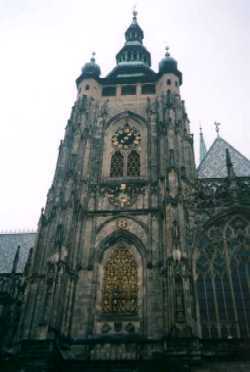 The Renaissance bell tower of St.Vitus Cathedral. 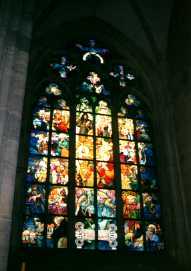 A stained glass window in St.Vitus Cathedral. 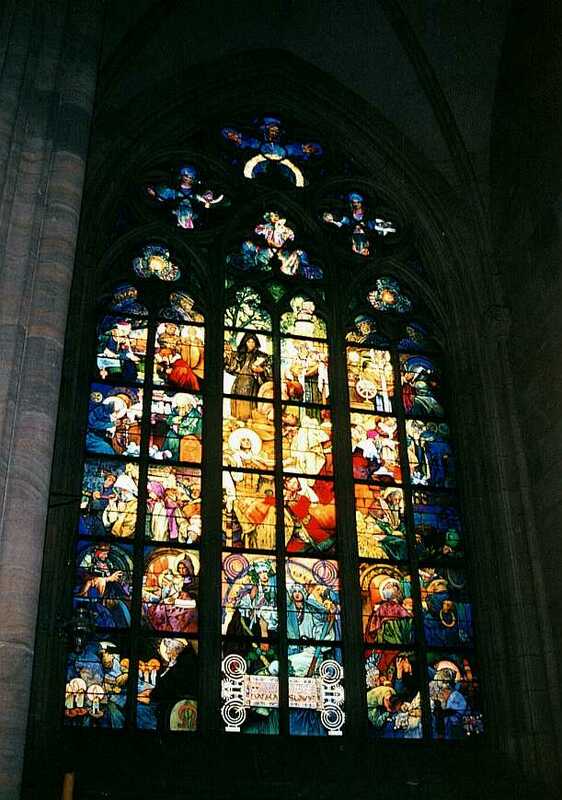 This window was actually designed by Mucha. 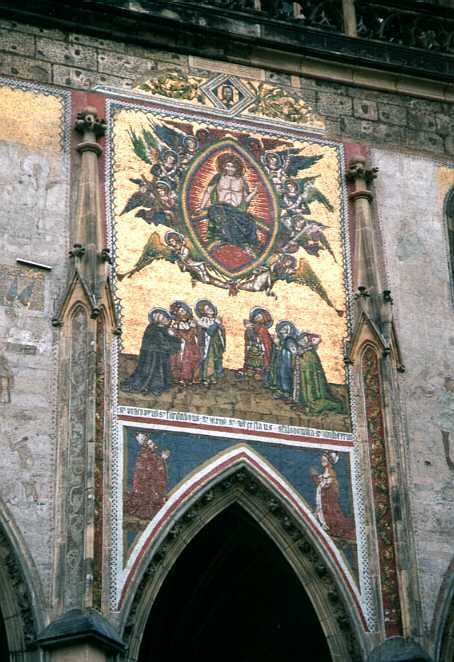 Newly restored, this is the Golden Portal above the western entrance to St.Vitus Cathedral. This was the main entrance until the 19th century. 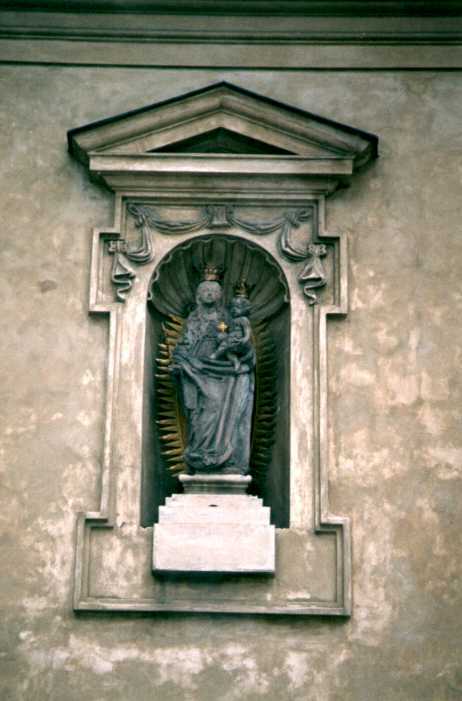 Madonna statue in the wall of the St.George's Monastery (now part of the Czech Republic's National Gallery) in the Prague Castle. 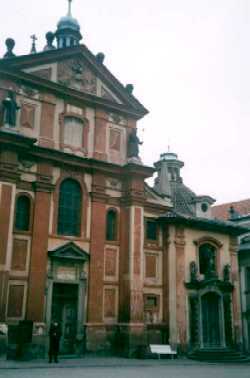 St.George's Basilica. This Romanesque Church which predates St.Vitus Cathedral now hosts frequent concerts. 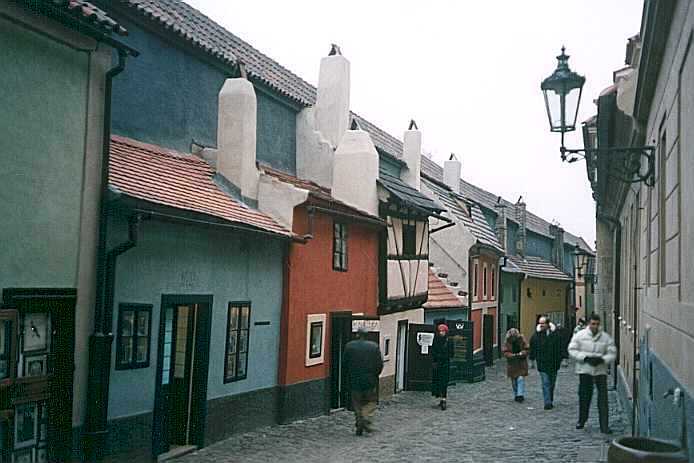 Golden Lane (Zlata Ulicka), just inside the walls of the Prague Castle. The housing in this lane was originally built (in the 16th century) to accommodate the castle's guards. The lane has also been home to goldsmiths, Prague's poorest people and some famous Czech writers. Kafka lived here (in the blue house) with one of his sisters for a brief period. 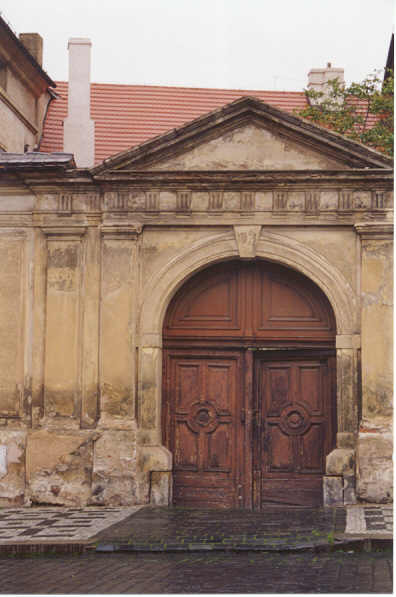 There are rumours that alchemists lived & worked here at one time. 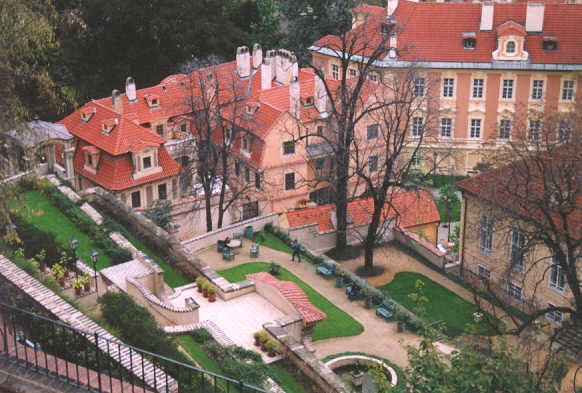 Looking down to the terraced gardens on the Mala Strana side of Prague Castle.